What a thrilling, action packed ride!! 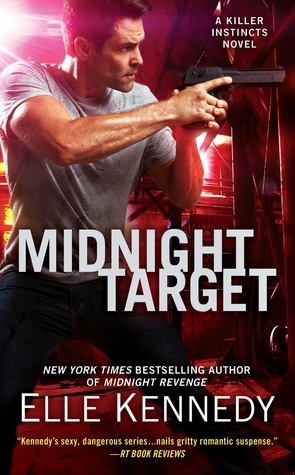 Midnight Target is about Cate, the daughter of a famous mercenary. When she was seventeen she met her father, and while he would do anything to protect her, he doesn’t want her in the same life as his. Cate has since dropped out of a college and become a freelance photographer. She’s working for a reporter on a story in South America when she captures something dangerous on film, and then finds her life in danger. Cate’s father comes to save her, along with one of his coworkers Ash. Cate can’t stand Ash after he rejected her advances on his years ago, leaving her humiliated and alone. Cate isn’t happy to see Ash, but he’s hopeful they can at least be friends. With tensions high and a criminal psycho after them all, things get rough and heated. I’ve really only read Elle Kennedy’s Off Campus series, along with her MM books and Erin Watt; I hadn’t picked up any of her Killer Instincts books before. But I love her writing style and trusted she would deliver a good story and a fulfilling read. This book was such a fun and fast paced read. It reaches almost 450 pages and didn’t feel long at all, it just flew by! Technically this is the eighth book in the series, but it can be read as a standalone. I personally can vouch for this because this was my first time reading this series and I was able to navigate the novel easily, even with all the background players. Despite this being about a couple that cannot be together (due to age difference in the beginning and daughter of the boss issues) there was only mild angst. I prefer a bit more, but it fit the tone and theme of the book. I really liked spitfire Cate and southern boy Ash, the two just made sense, even when they were friends only. I wish things had progressed a bit faster for the two of them, but enjoyed it very much once they did. The best part about the book though? The surprise MM plot mixed in between Liam and Sully. That was my favorite aspect of the book, I found myself waiting impatiently for their POVs because I just wanted MORE. Elle Kennedy is amazing in general, but when she writes MM I want to use the worship hands emoji all the time. Once my reading schedule opens up a bit more, I know for sure I will be going back and reading other books in the Killer Instincts series ASAP! And if you haven’t you should too!